The snow rangers had plans today, and the weather blew them apart. Instead of attending a long distance cross country ski race, we found ourselves contending with strong winds, blowing snow, wind chill. The ski event was cancelled, which was a good call on the part of the cooperating ski area and event organizers. 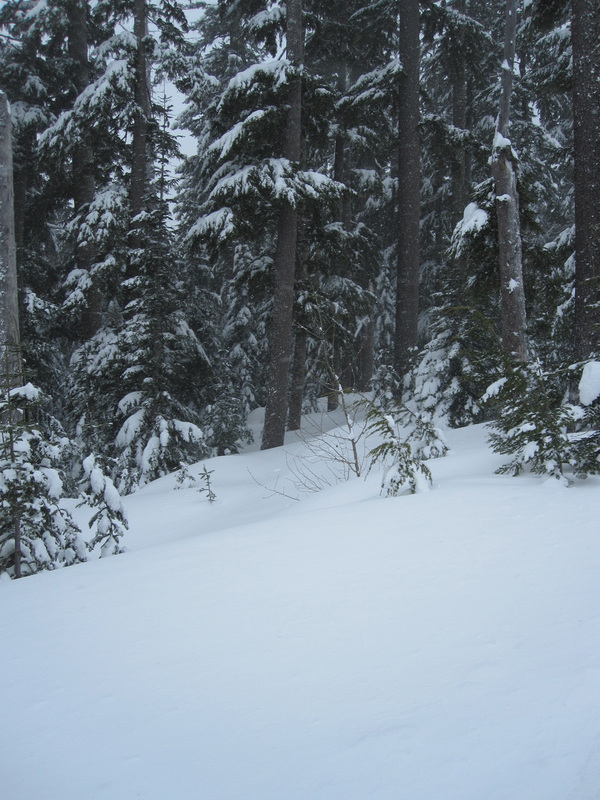 The avalanche danger was considerable to high on all slopes in the central Cascades. Instead there was snowmobiling to place some signs and patrol several routes. Our riding took us to Meadow Pass, right on the divide between east and west. The wind was charging over the mountains, whisking the snow into powdery drifts. The words “into the teeth of the storm” kept running through my mind. That’s what the wind feels like as it chews through the layers of clothing and nibbles on any exposed skin. Wind-driven ice crystals sting and bite like millions of snowy little piranhas. I stopped where the Pacific Crest Trail crosses the road. Many times I have hiked down out of the clearcut with a chainsaw and into the old growth hemlocks. Sometimes this road is the end of the hike, or the beginning. That’s summertime, and trail work. This is winter. This is what that place looks like with seven feet of snow. In any season, these old trees have presence and character. I am sure that if I listened carefully enough I could hear their slow stories of wind and other phenomena. Riding down, loading the snow machines, heading back to town. As soon as I walk into the house, I start filling the clawfoot tub with hot water. A long soak warms my bones and relaxes muscles. Then I can face making a savory warm meal and doing the rest of the evening chores. Air in motion thumps the house tonight, and I hear the rattle of ice pellets on the chimney. The bells on the eaves jangle and ding. My cheeks burn with the memory of cold. I didn’t find myself wanting to be there but I very much enjoyed the metaphors and descriptions… they rather MADE me go to those places.. just picked me right up and carried me off to where wind powered snow crystals stung & burned like little sparks & the breathy old growth Hemlock voices spoke into the winds, comingling the sounds..
Agree with maine7, love the metaphors, don’t wish I was there. The ice piranhas, the whisking, thumping, jangling, rattling wind…what a treat…to read.